Since its founding in 2011, Brighter Babies has rapidly gained recognition within the community for its commitment to high quality education and care for young children. 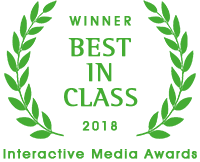 Brighter Babies has won multiple awards from various community and city organizations. 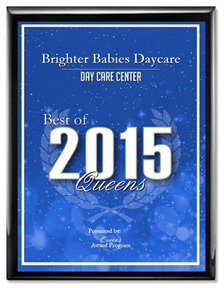 In 2015, the Queens Award Program awarded Brighter Babies “Best of Queens” for top child care center in the Queens borough. Ultimately though, we care most about what our families think about our school. Brighter Babies has many positive reviews on Yelp and you can see some of our families’ thoughts down below. The curriculum is well built around the kids needs and age (yoga, music, movement, arts) and the teachers are very caring and attentive. The ratio of teachers to student is higher than most daycares I have visited (for most classes they have more teachers than the recommended minimum). The location was perfect, but this is never the main criteria for choosing the best daycare for your child and we were lucky. The quality of care, both by the teachers and the management, is very high, which means that both children and parents are well-attended. The facility is very nice and big. They even have a little gym that kids love (my youngest one would always scream in delight every time we would pass by it), and the food served is of the highest quality. As I said, the teachers and staff have been part of our family for the last two years. We couldn’t have hoped for a better place for our kids to have a great start in life. Probably the most easily understood (for NYers) testament I can make for BB is that we lived in Sunnyside when she started, then moved to Jackson Heights about 6 mos ago, and I still make that long 7 train twice daily schlep with her because the center has been so great for her [my daughter]. She was (is) a pretty sensitive gal, and the teachers and administration have gone above and beyond to consider her needs and make sure that she felt safe and comfortable and fostered an atmosphere where she could blossom. Since our daughter’s been full-time, we’ve really seen her open up, gain confidence, and learn a tremendous amount. These are by far the top reasons why we love Brighter Babies and can’t think to move her to different care, though it may be closer or cheaper or easier. The rest is icing on the cake. All I can say is that I do not have a care in the world when I leave her for the day. She is a happy little girl and literally runs into her class room. All the teachers (even the ones in the other classes) know my little girl, it has really impressed me the care and attention they give to the little ones. The food is great – she has school meals and eats every bite even going back for seconds. She has a great schedule and her development has come on tons. I would definitely recommend Brighter Babies to anyone who is looking for daycare. The staff are attentive, caring and warm. The directors are excellent at keeping you informed with emergencies and just general information. Overall I have found the teachers/directors to be wonderful. Any concerns have been met in a quick fashion. I receive photos often of the babies doing activities and daily you are sent home with a sheet with exactly what they did, times/what they ate, when they slept, etc. The attention to detail is pretty amazing. The center is clean and from what I have observed everyone there is very positive and happy. I looked at a lot of day care options before deciding on BB, and they were far and away our first choice. While no place is perfect, my husband and I have always felt that the directors have a great vision for what excellent child care should be, and they do their absolute best to make that a reality. One of the best things is that the kids take a walk outside and play at the local parks/playgrounds nearly every day (when the weather cooperates). They also do a lot of arts and crafts, painting, etc. in the classroom (even the infants!) There are music teachers (I believe 3 separate ones) who come into the center each week, as well as a yoga teacher. (When we ask our son to show us his yoga, he immediately goes into down dog…adorable!) We often get photos (and sometimes video) during the day. There is an open-door policy, and the school encourages you to call (or drop in) and check on your child if you wish.